Oksana Savchenko came into the world with a serious condition: glaucoma in both eyes. Doctors were very late in diagnosing her condition, and the operation only partially saved the sight in her left eye. Yet this did not stop her from becoming one of the world’s brightest sports stars. By the age of 22, the Russian female swimmer had won everything that she could, set several world records and earned more than 100 gold medals. Oksana Savchenko meets us at the entrance to the Burevestnik swimming pool in Ufa, wearing dark glasses and with her hair in a bun. A bright, striped jacket clings to the swimmer’s broad shoulders. Her movements and her gait are measured. She looks around but does not notice us right away. We shake hands. Oksana removes her glasses and smiles shyly. We follow the champion into the swimming hall where she trains. In a small hall with gritty, pale green walls, a little girl is already warming-up. She can hardly tell the exercises apart, so her mother never leaves her side—another one of Igor Tveryakov’s pupils struggles with the challenges on the road to becoming an Olympian. Oksana Savchenko was born on October 10, 1990, in Petropavlovsk-Kamchatka. She won her first big race when she was 13. Since then, Oksana has won more than 100 gold medals and more than 50 races in European and world individual championships. Savchenko won her first three Paralympic gold medals at Beijing in 2008. 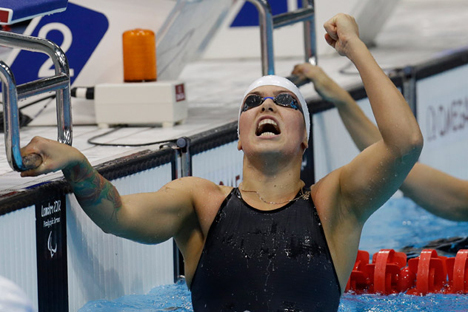 The Russian swimmer won five more in London and was ranked eighth among the Paralympic champions. Igor Tveryakov is Oksana’s trainer. “I noticed Oksana back in 2004, at the children’s championship in the Czech Republic,” Igor says. Oksana’s awards are not counted in tens but in hundreds. She won more than 60 times at the Russian championships and more than 50 times at the European and world individual championships. By virtue of the last two Paralympic Games, she has returned to the status of the most decorated athlete on the Russian national team. We sit at a light-blue plastic table next to a 25-meter long pool, which is half the size of the pools at all major global competitions. Oksana swims lengths at a moderate pace. Another swimmer is swimming in the same lane, and only when the pool empties do the Paralympians have the chance to train individually. “These conditions are adequate to keep in shape, but we have to travel to the training camps to achieve really good results. There were seven ahead of the Olympics, and now there are only three to train for the world championship. All the money has now been re-assigned to winter sports, to prepare for the Games in Sochi. But we will win! A fat cat doesn’t always give its best, but one that runs around the streets hungry is more nimble,” says Tveryakov, smiling. Tveryakov has his own story. His students often level accusations at the Paralympic athletes: They say that they were healthy and should not have taken part in the Paralympic Games. You can read an interview with those leveling these accusations in the local press. “For us, an invalid is a person with no legs or no arms; but, in the international Olympic movement, people with impaired physical capabilities are divided into categories in which they do not need to compete with each other. Everything is checked thoroughly by special commissions; you can’t deceive them. They do not like it when we win, though. Right away I said to the guys: ‘You have won some glory, but now there will be a black mark against you.’ Everyone is more jealous of Oksana than anyone else, because she is the most successful,” Tveryakov says. There is indignation, shame and bitterness in the trainer’s voice. “That was the worst year of my life. Arguments with my trainer, depression, past traumas resurfaced, new ones appeared, and I almost left sports completely, several times. Even now, I take my medals in my hands and I don’t understand how I achieved all this without going mad,” says Oksana, smiling. Oksana says that conversations about Paralympians being “charlatans” do not make her angry, but she is very offended by them. She recalls her first Paralympic championship in Russia, when the organizers did not even have the money to buy medals, let alone prize money. These financial difficulties, though, did not have any effect on the desire to win. The full article first published in Russian in Russky Reporter.